Hers is an extremely well-known face in business throughout Northern Ireland. But readers of Business Telegraph will know Brenda Morgan particularly well as the face of British Airways' partnership with the Belfast Telegraph Business Awards. This year, British Airways was headline sponsor of the awards for the fourth year in a row. As partnership manager for British Airways, Brenda is synonymous with the airline industry in all our minds - so it's a revelation to me that she actually started out in a very different sector. 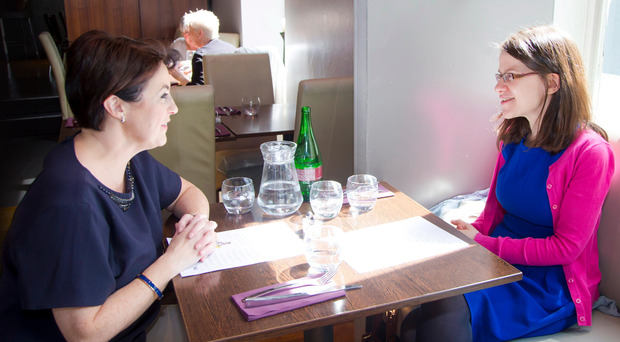 "After I left school and did my A-levels, I just wanted to get straight into the work," the Co Antrim woman explains, over some very virtuous lunch choices for us both. "I started off with JP Corry in building supplies and worked as the group stock controller for three or four years. "But I'd actually worked in Belfast International Airport in the duty free during the summer when I was still at school, so I suppose I did kind of fall in love with the industry there. "Once you've worked in it, it never leaves you." From the down-to-earth world of building supplies with JP Corry, she began to aspire to the heights of aviation, and joined then-British Midland (which later became bmi, and was bought by British Airways in 2012). Brenda worked for around two years for bmi in England before returning home. She lives in rural Co Antrim and does enjoy country living. But travel - as you might have guessed - is a big part of her job. Brenda is on the road to Dublin on many occasions and has also been to Philadelphia and Los Angeles in pretty quick succession at the time of our lunch. So as you'd imagine, Brenda does enjoy holidaying in Ireland where possible. She loves the fast-paced nature of the industry, and the challenges which come with developments such as IAG's recent acquisition of Aer Lingus, and the prospect of Dublin Airport becoming an additional transatlantic hub for BA. "That will free up capacity with regard to us developing the rest of the world." And she explains that the international scope of the airline means British Airways is not as preoccupied with the prospect of a Brexit as other airlines and businesses. Its boss Willie Walsh has had less to say on the matter than Michael O'Leary, with Ryanair's services limited to Europe. It's an extremely fast-paced industry, and the airline is constantly poised to react to world events. "Things really change overnight in this industry." It's also responding to customers' needs and technology - particularly with an app which orients a customer towards their passenger gate and can calculate how long it will take to get there. Some down-time is a must. Brenda reveals that the family has a ritual of watching BBC hospital drama Casualty on a Saturday night - a domestic scene far removed from the day job. But she'll always feel a strong affinity with the world of flying, nothwithstanding Casualty's allure. "Regardless of what end of it you're in, the passion never leaves you." By Margaret Canning With over 40% of the year's sales accounted for in the four weeks before Christmas, it's now the busiest time of year for Liam McBride, sales manager at Dillon Bass.